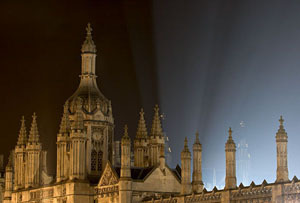 Photo from Cambridge in Colour, reproduced by permission. The 2007 Developments in Economics Education (DEE) Conference (formerly known as DEBE) was held in the Møller Centre, Cambridge, UK on Thursday 6th and Friday 7th September. Feedback was extremely positive. The full programme has abstracts for all sessions. Slides, photos, write-ups and video are appearing on this site during September. Paul Latreille of University of Swansea writes his Reflections on DEE 2007. See also the latest post on our blog, Economics in Action. Tim Harford, FT's "Undercover Economist" and presenter of the BBC's "Trust Me, I'm an Economist"
97% of delegates who filled an evaluation form said they would encourage a colleague to come to a future DEE conference. The previous conference, DEBE 2005, was a great success, with 98% saying they would recommend a colleague to come to a future conference.